Feeling the Force: are shared VR experiences the future of entertainment? Can virtual reality build meaningful social interactions? Earlier this year, I went to The Void’s Star Wars: Secrets of the Empire virtual reality experience. In a specially designed pop-up in the middle of a London shopping complex, a group of friends and I were equipped with a PC backpack, haptic vest and modified VR headset before we infiltrated an Imperial base on Mustafar. It was the best VR experience I’d tried for a whole host of reasons. It required zero set-up, the Star Wars tie-in was spot-on (even for die-hard fans), there was lots of shooting, plenty of puzzles to solve and clues to find, and the hardware felt high-end and performed well – it was great to roam around in VR untethered, and the haptic suit meant I could feel what was happening in front of me. And, most importantly, I was able to experience all of this with my partner and two friends by my side. One of the latest (and greatest) in a string of location-based VR experiences, Secrets of The Empire points to the huge potential of using VR to really bring people together, both physically and in a virtual space – and it turns out it was designed with exactly that in mind. We asked Ian Bowie, Lead Experience Designer for Star Wars: Secrets of the Empire at ILMxLAB, Lucasfilm’s Immersive Entertainment division, what the thinking behind including a group of friends in a Star Wars story (and allowing them to connect within it) was. The experience itself is an immersive whirlwind, and Bowie told us there’s a lot going on in terms of technology choices, appealing to the players’ senses with sensations and touch, but most importantly, storytelling. “Providing moments without dialogue from digital characters, opportunities to strategize, co-operate, react, discover, explore or even argue… these intended vacant spaces in the design make the experience successful and meaningful on an individual level,” he said. And part and parcel of the social VR experience is ensuring that everyone felt like they were an important part of a real adventure. “Creating this room for guests within the greater context of the planned story allows them to create personal sub-context to the adventure and have their own unique stories to tell, about not just what happened in our story, but how they as a group responded to it,” Bowie explained. So, one day soon will we be trading a trip to the cinema or bowling alley, or meeting friends at a bar, for a location-based VR experience? And can a medium that seems inherently isolating really be used to deepen social ties and create connections? Does VR have an isolation problem? There are plenty of VR experiences that are focused on encouraging people who are in different locations to come together and socialize, like Facebook Spaces. But physically you’re still very much on your own when you wear a headset at home. By its very nature VR is isolating because you need a dark space away from distractions to feel truly immersed. But VR may also have an isolation problem when it comes to public perception. The media heavily focuses on the social isolation concerns around VR use, which are perpetuated by its portrayal in entertainment, like Ready Player One, which may bring people together in The Oasis, but keeps them very much apart in the ‘real world’. But let’s not forget that VR is still an emerging industry. Many of us have been forced to try it on our own because there are barriers to entry, like costly headsets and PCs and a lack of space in the home. That means experiencing it with other people often just isn’t possible – and that’s where the appeal of location-based VR lies. Going to a physical space with others and venturing into a virtual world doesn’t always have to involve action, total body immersion and an eye-watering budget. The presentation and implementation of arts VR can benefit from an added social element too – the arts have, after all, been fueled by discussion, collaboration and connection for millennia. “One of the great things about what the industry calls 'in-location VR' is that it turns into a fun leisure activity that you can do with your friends,” award-winning VR specialist Catherine Allen from Limina Immersive tells us. Solid storytelling, good hardware and a seamless set-up are clearly key to the overall VR experience, but so is what guests feel and experience before and after. The storytelling element doesn’t stop when the VR story stops. Location-based VR isn’t exactly new – a number of VR arcades have been in operation around the world for some time. Brands are also bringing VR experiences to the masses more and more, like Imax VR, which has created dedicated spaces for people to enjoy VR experiences alone or with friends. There’s a lot of appeal to trying VR beyond the confines of your own home. There’s less of a financial commitment, no set-up required, and you don’t have to have a big room at home to get the most from it. But it’s also appealing because other people are there – even the most socially awkward of us thrive on making connections with others. That’s why it’s no surprise that a number of companies have been working on similar experiences to The Void, including Nomadic and Dreamscape Immersive. 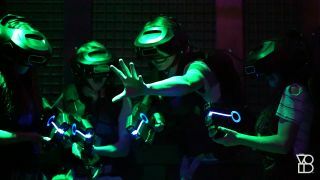 But unlike VR arcades, where you can't all experience the same VR world at the same time and go on an adventure inside it, they’re about full immersion and connection with others within the virtual world. It’s still early days, but there’s lots of scope for these VR experiences to become a natural part of our social lives, and as second-nature as heading to a restaurant or the cinema. So what do we need now? Companies need to think about their VR experiences as much for how they bring people together as for their raw entertainment value, and continue to innovate, whether that’s by immersing people in a galaxy far, far away or bringing them together to have a discussion after a VR film. And creators and developers shouldn’t see social VR experiences as a novelty; they need to adapt, change and value solid storytelling if they want people to keep coming back for more.